The Official Student Run Campus & Community Radio Station of St Francis Xavier University. YOUR Spirit. YOUR Tunes. YOUR Friends. YOUR X-perience. YOUR Radio. 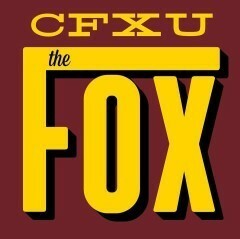 CFXU 93.3 FM “The Fox” is the OFFICIAL Campus/Community radio station of St Francis Xavier University in Antigonish, NS. Broadcasting at 50 watts from the Students’ Union Building on the StFX Campus, we can be heard around town at 93.3 on the FM dial. Filling the need for a community-based alternative voice in Antigonish, we are focused on providing opportunities, training, and support for our volunteers and staff within a diverse and open-minded environment that is not directed by commercial interests. CFXU is funded primarily by the StFX Students’ Union and through partnerships with various independent businesses at the local level. We are a member of the NCRA (National Campus and Community Radio Association) and the CRFC (Community Radio Fund of Canada).